My mom actually taught me how to make this recipe, and, apparently it was one of my late father's favorites. I remember the way the house would smell when she would make it for dinner. It was so crazy to have something that sounded so fancy at home! It's a great way to create a unique and delicious flavor using very few ingredients. Technique tip: When breading anything with flour, egg and breadcrumbs, use your left hand for flour and breadcrumbs, and the right hand for the egg. This way you avoid having all of the batter caked onto your hands and making a mess. 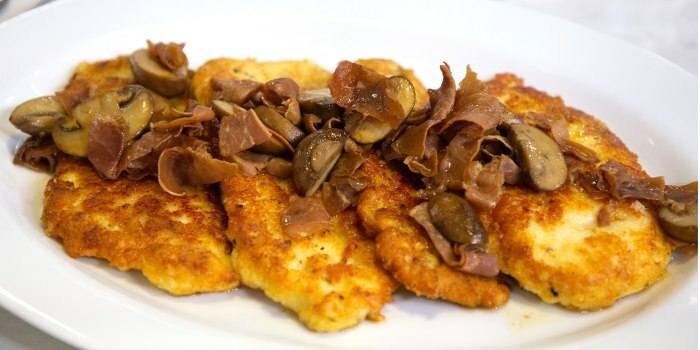 Swap option: You can use veal cutlets or even pounded out beef medallions for this. Pecorino Romano can also be substituted for Parmesan. 1. Place the chicken breasts on a cutting board and cover with the plastic wrap. Pound with a flat meat mallet until they are uniformly about 1/4-inch thick. Place the chicken in a shallow baking dish and add the buttermilk. 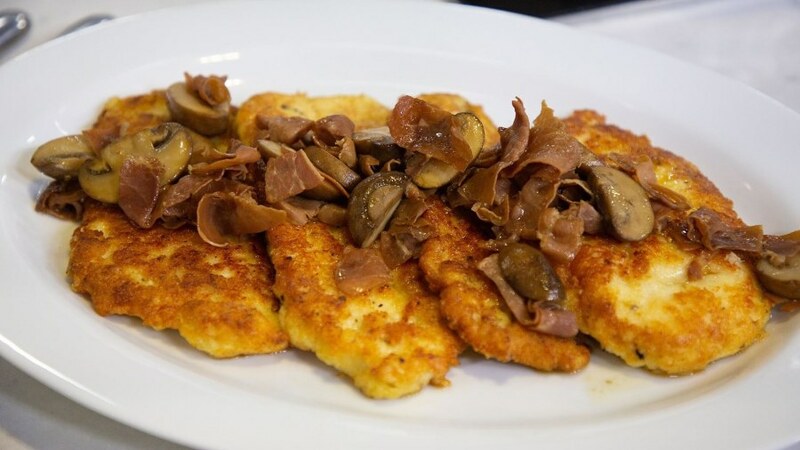 Turn to coat the chicken cutlets, then cover the dish and refrigerate overnight. 2. Combine the Parmesan, garlic powder, salt and pepper on a plate or in a shallow bowl. Put the flour and beaten egg into two separate bowls. Dredge each chicken breast in the flour, then in the beaten egg, and then in the seasoned cheese, placing each as it's done on a platter or baking sheet to set. 3. In a large skillet set over high heat, heat the olive oil. Slip the coated chicken breasts into the pan and fry for 5 minutes. Flip them over and cook until they are golden brown, about 3 minutes. Transfer the chicken to a platter and loosely cover to keep warm. 4. Lower the heat to medium and add the prosciutto to the pan. Cook for 1 minute, then add the mushrooms and sauté until they are nicely browned and their moisture has evaporated, about 5 minutes. Pour the Marsala wine into the pan and bring to a boil. Cook until thick, about 3 minutes. Add the chicken stock and simmer for 2 minutes until somewhat reduced and thickened. Stir in the butter and heat until just melted. Return the chicken to the pan and cook for 2 more minutes to heat the chicken through. Season to taste with additional salt and pepper as desired and serve hot.